From Goodreads: "Enter a tangled world of secrets and intrigue where a girl is in charge of other’s destinies, but not her own. Thrust into the opulent Western Coventry, Adelice will be tried, tested and tempted as she navigates the deadly politics at play behind its walls. Now caught in a web of lies and forbidden romance, she must unravel the sinister truth behind her own unspeakable power. Her world is hanging by a thread, and Adelice, alone, can decide to save it — or destroy it"
Thank you to the lovely people at Allen and Unwin for providing me with a copy for review. This in no way influences my review, all opinions expressed are my own. 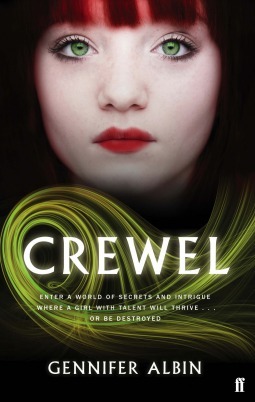 Where to even start with Crewel? It was a new and unique concept, at least to me. Being able to alter threads of time? Pretty cool! Adelice Lewys has a gift. Or I guess you could call it a curse. In a world where women, known as Spinsters, can thread time, nothing is easy. Time is nothing but a blanket of sorts, made up of threads. Spinster contain the ability to weave new threads but to also rip existing threads. Altering life and causing death. Adelice's parents spent her whole life trying to conceal her from the Coventry, they didn't want her ability to become known. By anyone. At the end of the school year all the girls under go testing, testing to see if they could become a Spinster. Adelice has managed to hide her ability her entire life, but she slips during testing. She slips and she knows. She knows that they will come for her that very same night. She doesn't tell her parents, so when they show up her parents have to act quickly. Adelice gets shoved into a secret under ground tunnel she knew nothing about with her mum and her sister. While her dad is left there to by them some time. Their plan fails though. Adelice gets caught, and running from collection is punishable by death. Only she wakes in the Coventry to find herself in a cell. Surely that is better than death? Adelice starts to develop her ability inside the Coventry and along the way she discovers that she isn't like the other girls there. She is far more special than she ever thought, than any of them ever thought. A unique and fast paced read that kept me on the edge and wanting to know more. I pleasantly surprised to find such a unique read in Crewel. Can't wait to see where the second book takes us and a very big door was opened right at the end of this story. If you liked this review then make sure to check out my review of The Secret Hour by Scott Westerfeld, another book revolving around the concept of time. What do you think? Does this sound like your type of read?